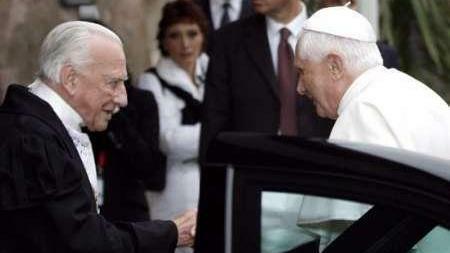 The late Grand Master Andrew Bertie with Pope Benedict. The process for the beatification of the late Grand Master and Prince Fra' Andrew Willoughby Ninian Bertie is to begin in the coming months, the Grand Magistry of the Order of Malta said. Fra' Andrew died in Rome on February 7, 2008 at the age of 78. He was admitted in the Order of Malta in 1956 and was the 78th Grandmaster, the successor of Blessed Gerard Sasso. Fra' Andrew was the youngest son of the 7th Earl of Abingdon and both sides of his family had royal ties through the centuries. Fra Andrew was educated at Ampleforth and the School of Oriental and African Studies at the University of London. He taught French and Spanish for 23 years at Worth School. In April 1988, he was elected Grand Master of the Order of Malta by Fra' Angelo de Mojana di Cologna. He followed closely the official motto of the order, Tuitio Fidei et Obsequium Pauperum, or "Defence of the Faith and Service of the Poor." Several years ago, the Order of Malta was credited with having around 13,000 knights and dames, 80,000 volunteers (15,000 trained as doctors and nurses) and a presence in 200 hospitals. The Order has an official presence in 120 countries. Fra' James-Michael von Strobel has been charged with compiling a list of people in the United States who knew Fra' Andrew Bertie and would support the cause.